At La Plata Dental, we rely on natural looking, composite resin fillings to restore minor tooth decay or damage. This tooth-colored material is shaded to blend flawlessly into the smile line, so you won’t even notice your restoration. The placement process is simple. We numb the area around the damaged tooth. 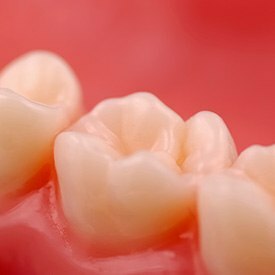 Then, we remove any decayed or weakened tooth structure. The putty like resin is applied directly to the prepared tooth where it seeps into small pits and grooves forming a strong bond. Once we’ve shaped the filling into position, a curing light hardens it into place.